Polarization will continue to become a key feature of not only Korean society but also the landscape of industries this year, the Hana Institute of Finance said in its recent industries outlook report for 2014. 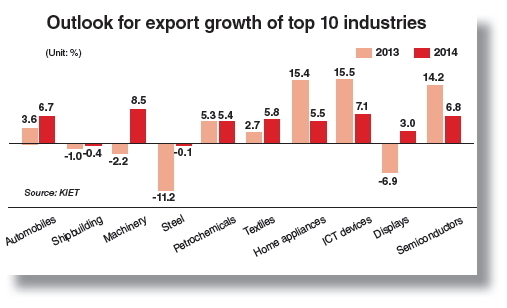 “The export-driven Korean economy will be on a gradual recovery track in line with a pick-up of the global economy, but the polarization by industry and by corporate ranking within industries will intensify,” the report pointed out. By industry, the information technology sector, led by Samsung Group and other tech giants, will continue to power the nation’s economic growth, while non-IT sectors except the car industry are forecast to remain stagnant. The projection means that economic dependence on the nation’s top two corporate names ― Samsung Electronics and Hyundai Motor ― will further deepen this year. Data from the Korea Exchange found Samsung Electronics and Hyundai Motor accounted for more than half of net profits generated by the top 100 companies by sales Korea’s as of 2012. The share of net profits generated by the two heavyweights continued to increase from 19 percent in 2007 to 35 percent in 2009, 36 percent in 2011 and a record-high 51 percent in 2012. South Korea’s biggest portal site, Naver, recently decided to shut down its microblogging service Me2day in June of 2014, saying it will focus on strengthening its core competitiveness against big foreign rivals. In some respects, it has humbly admitted defeat, unable to compete with U.S. social media giants like Facebook and Twitter, which have gradually expanded their clout in Korea. Facebook revealed in July that it has about 11 million monthly active users in South Korea, 6.8 million of whom access Facebook at least once a day. 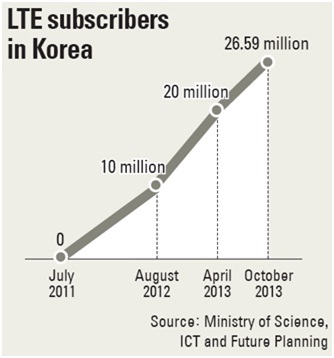 According to The Hankyoreh, the number of Twitter users in the country was estimated at 7.21 million as of August. As global titans advanced onto Korean soil, major domestic social media sites went on the defensive, closing down their services. For instance, SK Communications’ C-Log, KTH’s Pudding.to and I’m IN, and Daum’s yozm all terminated their services. Experts said the first-mover advantage is one of the main reasons domestic SNS companies struggle against global IT firms. 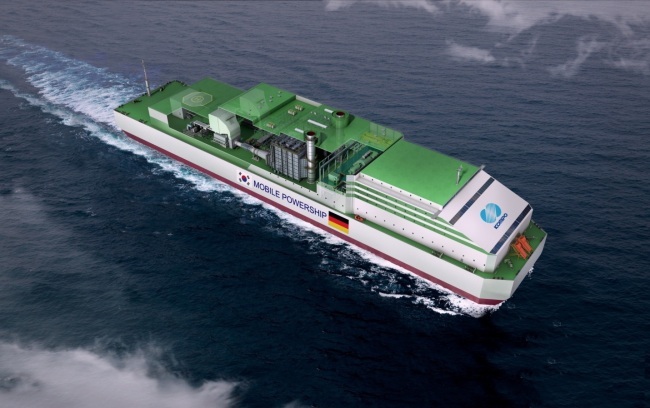 An artist’s rendering of a mobile power ship. 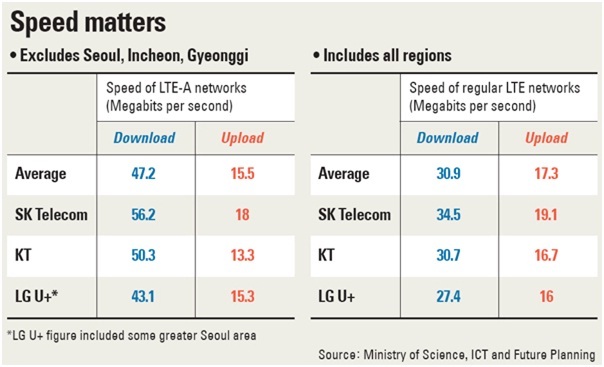 Source: Korea Herald. The world’s first project to build a large-scale power generation ship was launched on Tuesday in Seoul as three Korean industrial giants and German-based Siemens signed a memorandum of understanding at Coex InterContinental Hotel, companies said. Three Korean the companies joining the project are Korea Midland Power Co., Hyundai Heavy Industries and Polaris Shipping. The four companies formed the consortium to install an 880-megawatt power-generating facility on a floating storage regasification unit, or FSRU. The project will require a total investment of $940 million. Target overseas markets will include the Philippines, Indonesia, Brazil and other countries where the power rate is high and power shortages have become a critical issue. The partner firms expect that cost-saving power ships could appeal to overseas power markets since they can reduce civil complaints as they do not require large-scale sites on land and will cut costs required to install new power cables. Samsung and LG will unveil prototypes of remote-controlled flexible OLED TVs ㅡ considered the next big thing in the industry ㅡ at the International Consumer Electronics (ICES) next month. The ICES is scheduled for Jan. 7 to 10 at the Las Vegas Convention Center. Because the annual exhibition has long been considered as the place to see new trends and devices in the industry, attention is focused on which new technologies will stun the world. The Korean electronics giants, which gained attention last year with 55-inch curved OLED TVs, are preparing to wow participants and dealers again this year by unveiling the flexible OLED TVs. “Samsung will unveil a prototype of the flexible OLED TV at next month’s ICES,” said an industry official, who is familiar with the issue, Sunday. He declined to unveil specific details about the new TV ㅡ only saying that the display size will be “huge.” The basic concept of the remote-controlled flexible TV is that users can use a control to bend the screen, enabling viewers to get a better viewing angle. Existing OLED TVs are just curved, not flexible and the viewing angle is fixed. Samsung said the latest technology will use plastic-based OLED displays and a back panel that can deform the display. For full articles, see Korea Times.